Congratulations to the nominators and all of the people involved in the campaigns to save these bridges! 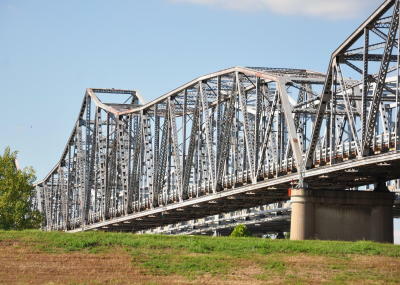 The bridge: Built 1891, this four-span pin-connected Pennsylvania through truss crosses a back channel of the Ohio River between Ohio and West Virginia. It was closed to traffic in 1988 and continues to deteriorate. The significance: While overshadowed by the nearby Wheeling Suspension Bridge, this is still an ornate and rare example of a multiple-span Pennsylvania truss. It is a contributing resource for the National Register Wheeling Island Historic District. 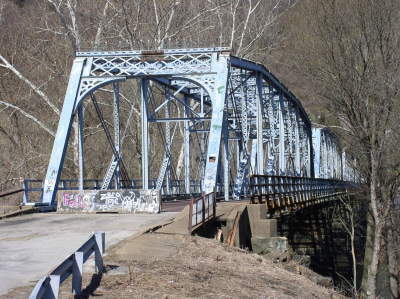 The situation: Not content with demolishing the nearby Bridgeport Bridge, the West Virginia Division of Highways now wants to remove this bridge. The plan: The Aetnaville Bridge represents a key missing link in a bike trail between West Virginia, Ohio, and beyond. Ohio Valley Trail Partners is pushing the save the bridge and restore it for bicycle/pedestrian use. This is a reasonable idea, but action will need to be taken soon before WVDOH gets bulldozer-happy again. The bridge: This is a two-span pin-connected Pratt through truss relocated here in the late 1950s. The two spans were originally part of the six-span Second Avenue Bridge over the Arkansas River in Dodge City, built 1906. Truss bridges in western Kansas are exceedingly rare. The situation: The bridge failed an inspection in May 2012 and the county wants to replace it with a culvert. However, the culvert would be prone to flooding, making access to local properties difficult or impossible during wet weather. The plan: Wayne R Keller, who owns a ranch on the road, is trying to stop the county from demolishing the bridge. The bridge could be repaired -- the biggest issue is a broken pin that, as it turns out, is not a pin at all, but a makeshift piece of metal used when the bridge was reconstructed in the 1950s. 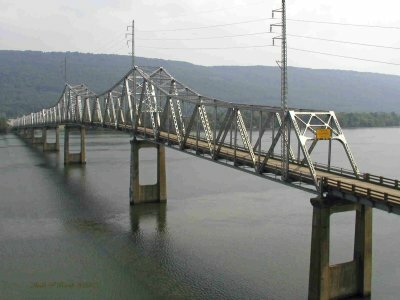 The bridge: This 1930 cantilever through truss carries eastbound AL 35 traffic over the Tennessee River (Guntersville Lake) near Scottsboro. A modern parallel bridge, built 1985, carries westbound traffic. The significance: Starting in 1927, the Alabama State Bridge Corporation built 15 memorial toll bridges across the state. The B.B. Comer Bridge is the last remaining bridge from this era. 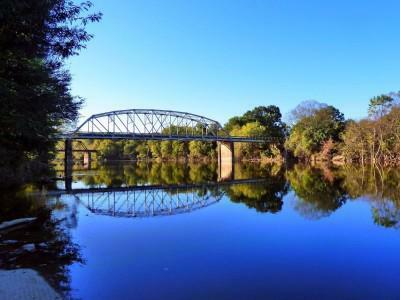 Alabama's inventory of historic metal bridges continues to dwindle, a point made clear with the ridiculous loss of Lauderdale County's Ghost Bridge in January. The situation: Construction started in 2007 to build a replacement bridge on a new alignment. This project is expected to be finished in 2015, concluding with the demolition of the B.B. Comer Bridge. The plan: A vigorous Facebook campaign to save the bridge has over 2,000 members. The bridge could be preserved as a bicycle/pedestrian walkway. Since the Tennessee River is a navigable waterway, it may not be realistic to save the whole bridge -- especially with the U.S. Coast Guard involved -- but some effort could still be made to save the southeastern approach spans as a walkway. This wouldn't be unprecedented: the Old Railroad Bridge over the Tennessee River at Florence could serve as a model. 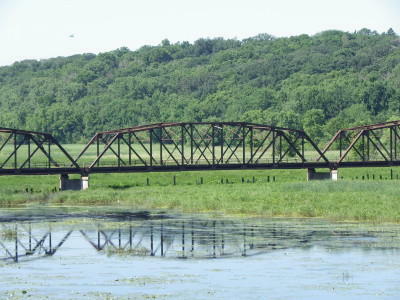 The bridge: This is a five-span riveted Camelback through truss built in 1920 over a lake next to the Minnesota River. It was bypassed by a new bridge on Cedar Avenue in 1979. 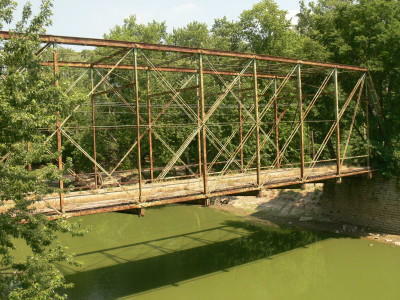 The City of Bloomington reluctantly took ownership in 1981, but by 2002, the historic bridge had deteriorated to the point where it was deemed unsafe even for pedestrians. The significance: Five-span through trusses aren't exactly around every corner. Last year, the Bloomington Historical Society received a state grant to prepare a nomination to list the bridge on the National Register. The situation: The city wants to demolish the bridge and replace it with either a UCEB or a berm that would provide bicycle/pedestrian access across Long Meadow Lake. However, the land surrounding the bridge is part of the Minnesota Valley National Wildlife Refuge, and the federal government has refused to issue permits to allow demolition. For now, with the two sides at a stalemate, the bridge continues to deteriorate. The plan: Rehabilitating the Long Meadow Bridge would restore an important bicycle/pedestrian link across the Minnesota River waterway. The Bloomington city engineer is adamant that the bridge must be demolished, so it will be up to local organizations or some other government agency to save the bridge (and take it away from the city's clutches). The bridge: This is an 1887 wrought-iron Whipple through truss. It was bypassed by a modern bridge in 1984, but was allowed to remain standing. The significance: Even in a state known for its Whipple trusses, the population is growing thinner. The situation: The stone abutments are crumbling, putting this bridge in jeopardy of collapsing. In 2009, Tony Dillon posted, "It is wrought iron so the trusses are in pretty good shape. However the problem lies with the trees that are growing at the ends of the bridge. The abutments are made of unusually small stones, and the tree roots are starting to cause some major separation." The situation hasn't improved since then. The plan: Unless the abutments can be repaired somehow, a new home for this bridge will need to be found before it is too late. Meanwhile, the Feederdam Bridge in Clay County (1894 Whipple) faces the same situation. The bridges: This is a pair of cantilever through trusses over the Missouri River in the Kansas City area. The Fairfax Bridge, built in 1935 and now carrying southbound traffic, is the older of the pair, but the northbound 1957 Platte Purchase Bridge is also historic in its own right. The significance: Cantilever trusses over the Missouri River in Missouri are an endangered species. The Miami and Hermann bridges have already been demolished; the Amelia Earhart is next; and the Daniel Boone and Washington bridges will fall in the coming years. Before long, the Fairfax Bridge will be the oldest of its class in Missouri. It is National Register eligible. The situation: MoDOT is currently studying "alternatives" for the two bridges, but naturally all of the alternatives feature demolition of at least the Fairfax Bridge, and possibly the Platte Purchase Bridge as well. The plan: Kansas City has a serious lack of bicycle/pedestrian access across the Missouri River, and the Fairfax would be the perfect ticket to correct this problem. If a new bridge is built, the Fairfax should be retained for bicycle use -- a move that would somewhat mitigate the shortsighted decision to destroy the Chouteau Bridge in 2001. The bridge: This is a bowstring through truss, reportedly built 1868 by the King Iron Bridge Co. The significance: If the 1868 date is accurate, this might be the oldest remaining bowstring truss in the country. It is National Register eligible. The situation: The bridge is now derelict with the deck missing, but is otherwise in decent condition. The plan: Although not in immediate danger, this bridge is too significant to risk allowing it to succumb to Mother Nature. In 1993, McLean County pursued federal grants to build a park next to the bridge and refurbish it for pedestrian use, but that idea fell through. It's time to try again. The bridge: This is a bowstring pony truss that still carries traffic, but with very low inspection ratings. It has the appearance of an 1870s-era King Bridge Co. span. 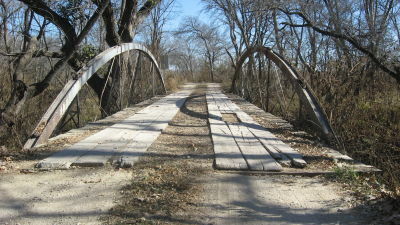 The significance: This is one of only five known bowstrings in Texas, and the last to carry vehicular traffic. The situation: The low rating makes this a likely candidate for replacement at some point in the future. Roger & Kathleen Schumacher posted this comment: "Come quick, every old bridge in the area is being replaced." The plan: Ideally, this bridge could be rehabilitated to continue carrying light traffic. If that isn't feasible, then this bridge should be preserved in a new location (it's only 70 feet long). Meanwhile, the abandoned Jonesboro Bridge in Hamilton County, with a nearly identical design, also needs attention. The bridge: A cantilevered through truss, this 1939 bridge carries four lanes of traffic high above the Black River Ship Channel. The significance: An iconic part of Lorain, Ohio, this bridge is National Register eligible and recognized as "Select" on the Ohio Historic Bridge List. The situation: Despite having a relatively good sufficiency rating (58.7), officials want to get rid of this bridge. The Northeast Ohio Areawide Coordinating Agency website says that the bridge is programmed for replacement starting in 2016. The plan: As a "Select" bridge that is still in reasonably good condition, the government needs to do a better job of exploring alternatives to replacement. If the current bridge is too narrow -- the usual excuse for demolition -- then why not consider building a parallel bridge? 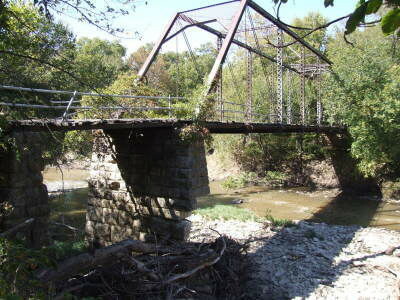 The bridge: Originally built in 1933, this Parker through truss was relocated to Arkadelphia in 1960. The significance: This is one of a dwindling number of through trusses on Arkansas state highways. It was added to the National Register in 2006. The situation: AHTD has announced plans to replace the bridge, although squabbling over the location of the replacement bridge has delayed the project. The bridge has a relatively decent sufficiency rating (44) and is not considered structurally deficient. The plan: If the new bridge is built as part of a bypass some distance away, then it makes more sense to retain the old bridge for local downtown traffic. AHTD has previously offered the bridge for adaptive reuse, with no takers, but the bridge doesn't necessarily need to be reused at all -- it's just fine where it is, as long as heavy highway traffic is diverted elsewhere. I had originally planned to only pick ten winners, but three more worthy bridges crossed my desk soon after the nomination deadline. These bridges are too important to ignore: the first is nationally significant, while the other two face urgent threats. As a result, I've decided to expand the winner's circle to feature "13 for '13." The bridge: This one-of-a-kind bridge built in 1891 has the appearance of an eyebar suspension bridge, but is usually described as a "two-hinged inverted trussed arch." The significance: This bridge has been the subject of intense engineering analysis, including detailed HAER reports, to determine exactly how it functions, a question that is still open to debate. The bridge was added to the National Register in 1978, a very early date. The situation: PennDOT closed the bridge to traffic in May 2012 because "one of the cross member supports snapped." A letter dated Jan. 14, 2013, states that the agency "is in the preliminary phase of the transportation development process to establish a statement of purpose and need and study alternatives..." Unfortunately, based on Pennsylvania's reputation, it's easy be cynical and expect that the "alternatives" will consist of (a) demolition (b) demolition or (c) demolition. The plan: It may not be feasible to repair this bridge for vehicular use, especially with increasing volumes of traffic connected to the natural gas fracking industry in the area. However, even if a modern bridge is built, there is absolutely no excuse for removing this nationally-significant structure. This point needs to be expressed to PennDOT early and often. The bridge: Built in 1905, this pinned Pratt through truss was relocated in 1926 to span the Dan River on Seven Island Road. The significance: This is one of a dwindling number of pin-connected truss bridges in North Carolina. 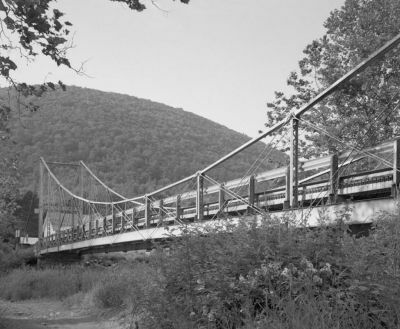 The situation: In 2005, when NCDOT was prepared to replace the bridge, the Town of Danbury agreed to take over ownership, hoping to eventually use it for a pedestrian crossing at a park. In preparation, the superstructure was moved to a private field, but the town's five-year contract with the landowner to store the bridge has expired. Now the town, which does not have the resources to move and restore the bridge, is trying to find a solution -- but the clock is ticking. The plan: It would be a shame to lose this bridge after it was already "saved" once before. Since the bridge is sitting on blocks over dry land, this represents an easier restoration project than usual. The town is soliciting proposals for finding a new home for the bridge; see the town website for details. The deadline is Feb. 26. The bridge: Jim Lytton discovered and photographed this wrought-iron Pratt through truss, built in 1886 by P.E. Lane. The significance: At present, only six known P.E. Lane bridges remain across the country. It seems almost certain this bridge would be declared National Register eligible if formally reviewed. The situation: Abandoned on a private farm lane, the main stone pier on this bridge shows an alarming amount of decay. It's a small miracle that the truss has held firm this long. The plan: Robert Elder writes, "I strongly suspect that there would be interest in preserving this bridge if local residents and officials were made aware of its existence." I was by the span on 4/30/2014. Not inspecting this one but traveling between other inspection sites. The bridge is open and posted at 10 tons. Gas fracking trucks travel by every few minutes but don't cross the bridge. They do pass under the limited vertical clearance from the eyebars to the anchorage. I watched one miss by inches and I would expect a disaster before too long. Has anyone heard any news on the Lower Bridge in English Center. Are they going to keep the bridge? Is Penn Dot in agreeance to save and restore the bridge? With the Natural Gas Fracking, let them take another road, they are probably the ones responsible for breaking it. Let them pay for the repair and then have them keep off. "Historic photographs of the English Center area reveal that the Upper Bridge was of the same type of construction as the Lower Bridge. The major distinction was that the Upper Bridge was larger: sixteen panels can be counted on the Upper Bridge versus the twelve panels on the Lower Bridge. A replacement for the Upper bridge was built in 1932. The Lower Bridge at English Center was placed on National Register in 1978." Characterization of the English Center Bridge as "one of a kind" is misleading. Dean & Westbrook built two of these bridges in English Center in 1891. The surviving bridge was known as the "Lower" of the two. The "Upper" bridge, slightly larger, but of the same design, was demolished years ago. I think that Henderson Memorial Bridge project may be a repair project. I know it says "replace" on the title, but if you click the link to the Location Map, the map is labeled "Bridge Repair." Also, the project cost is listed as $3,250,000 in total. I don't think you can replace a high level bridge over 1500 feet long and four lanes wide for 3.2 Million. Maybe 32 Million. I am reaching out currently to the Lorain County Historical Society about the threat to the Henderson Memorial Bridge and the fact it won a truss award. I will see what kind of feedback we can get. Lorain County seems to have a pretty well developed historical society and there is plenty of time to voice an objection to demolition. I fully support the expansion of this list to 13 bridges. These extra three do not dilute the TRUSS awards at all. This year had a particularly good list in my opinion. How exciting to see some of the bridges that Workin' Bridges has been involved with to some degree over the last year and more for us to try to get involved with. Good work James. What you have made with so many collaborators is terrific. More will be revealed this week with the Mulberry Creek Bridge. That/random metal was actually a resourceful fix and lasted sixty years, just too bad it was part of an axel with a hole drilled thru the center, the keyway channel was the real giveaway. Wayne has a court date and if that fails KSHS has determined this should be repaired and retained so ACE hasn't given the county any permits. The Old Cedar Ave. (Long Meadow Bridge) has been given more money and will go into engineering to 60%. I think RFP should go out soon. Workin' Bridges is now on the list of consultants to study the English bridge next summer and would like to be part of Aetnaville crossing. I heard a lot about that one at the Preserving the Historic Roads Conference. Bowstrings are my first love and I will certainly contact those folks, sooner in Texas to get more photos. Thanks again for the new bridges to follow.